Based on Dashiell Hammetts best-selling novel, The Glass Key is an intricate murder mystery. This early adaptation is not as well know as the Alan Ladd version, but is very much worth seeing. Different in some ways, eerily similar in some ways, it’s usually more raw than the later remake. The car crash that opens the movie is still jarring today! A great gangster flick. 1935 – BW – 80 Min. 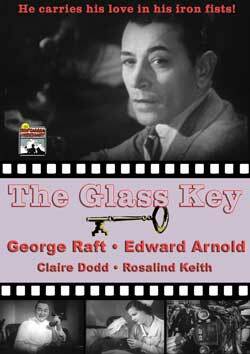 The Glass Key, starring Alan Ladd and Veronica Lake is also available. George Raft, Edward Arnold, Claire Dodd, Rosalind Keith and Charles Richman.